The idiosyncrasy with which the long-revered songwriter has built his legacy on transpires just as fascinatingly through a live venue as it does on his studio records. Tom Waits is notorious among his rabid fanbase for his reluctance to tour. When a string of dates was announced in 2008, a mere two years following his previous touring commitments, it felt like a token of gratitude between Waits and his long-standing acolytes. A strict two-ticket-a-person limit, however, did not keep the shows from selling out immediately, and the inevitable heartbreak that struck those shut out commenced as the grizzly troubadour hiked out on his handful of gigs, blazing his tumbling trek primarily through the southern states of America. 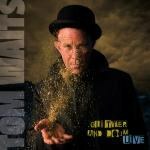 Given how enthusiastic and loyal Mr. Waits's followers tend to be, it seems like a no-brainer that a consolation of sorts in the form of this live album would materialize. Given how steadfast Mr. Waits is in his consistently brilliant output, it is also a no-brainer that the set is a satisfying, hearty portrait of his ravishing, bizarrely irresistible performance nature. This marks Waits' third venture into the realm of live albums, each release thus far serving to showcase the character of the era it follows. Nighthawks at the Diner, arriving around 1975, found him in the throes of his transition from a jazzy, folky singer/songwriter to a Beatific barstool laureate, spooling off eccentric, foggy tales of sketchy backstreets and shady prowlers in the night. Big Time (1988) documented Waits amidst his reinvention in the 1980s as he found his footing as a cantankerous, percussive junkyard growler, reworking the tried-and-true persona that he'd built his career on, which was distinct, but had also painted him into a corner. Fast forward to 2009, and Glitter and Doom's purpose reveals itself as a testimony to the Tom Waits we've come to know and love from Mule Variations henceforth: the weary veteran expanding and refining his melting pot mixture of Americana, treating the sinewy, leathery forms of blues, folk, country and jazz as if they were all from the same haggard backyard. In his squawking, knee-slapping demeanor, Waits leads his loose, ragged backing band -- consisting of Vincent Henry on woodwinds, Omar Torrez on guitar and banjo, Patrick Warren on keyboards, Seth Ford-Young on bass, and Tom's sons Casey and Sullivan on drums and clarinet, respectively -- as they sputter through a collection of songs that draw out the wild-eyed spirit contained within them, hurdling around with an assured, streamlined vigor that fits these tunes like a glove. A portion of these are performed close to the chest of the originals, offering open-hearted renditions of fan favorites, while others are totally revamped into nail-banging, rowdy crowd-pleasers, whipping the audience into a hot-mouthed frenzy who hang on Waits' every rollicking, boisterous gesture. Stitched together by Waits himself, utilizing multiple shows, the transitions and cohesion of brassy, barreling bravado are mostly seamless, fluidly trickling out a signature blend of kooky, offbeat humor and twisty, dog-eared narrative. The most remarkable part of this recording is how effortless it all feels, its natural juxtapositions smoothly complementing the rough-hewn, crumbly beauty of the music. It's a testament to the man's inherent gifts as a showman and a storyteller that he's able to retain that campfire glow among his beholden, slack-jawed fans across a slew of gigs, never once sacrificing the unique ambiance he brings to each individual performance. The show bursts open with a scorching, clamoring rendition of "Lucinda" that bowls its way into the stuttering "Ain't Goin' Down" and back again without missing a beat. On "Going Out West", Waits wheezes his way through a tattered, spell-binding version of the Bone Machine classic, dragging out the chest-baring bluster of its studio carnation with a zesty essence that burns down the house and builds it back up again. On a rousing "Falling Down" -- a cut only released prior on Waits' previous live album, interestingly enough -- the possessed singer/songwriter shakes and shudders about, exorcising what feels like burning demons spilling out of his lungs as he belts out the titular phrase in a manic swagger that's equal parts backwoods rambler and front-porch foot-stomper. Snaky, billowing renditions of "Trampled Rose" and "Get Behind the Mule" threaten to topple their more familiar originals, while elsewhere Waits indulges his schmaltzy, balladeering side with "I'll Shoot the Moon" and "Green Grass", skirting self-parody with a sly grin and a winking eye, yet never succumbing to their ever-tempting pitfalls. It would have been nice if Glitter and Doom included a few more buried treasures from Orphans, but ultimately that's nitpicking, since what's here does a more-than-ample job soaking up the raunchy, scrappy heart this album sets out to spotlight. With his unmistakable, bourbon-soaked, smoke-burnished voice and an inimitable, rattling presence that grows more wild and woolly by the year, the idiosyncrasy with which the long-revered songwriter has built his legacy on transpires just as fascinatingly through a live venue as it does on his booming records. As a snapshot of his increasingly rare live performances, this set is a flying success; as further proof that Tom Waits is one of America's most treasured, consistently compelling artists, it's a knock-out.